Are you the kind of person who just can’t get enough of a good thing? Looking for a better way to squeeze out that last little bit of G/flex adhesive from your tube rather than resorting to pliers, a vise or maybe even Grandma’s rolling pin? 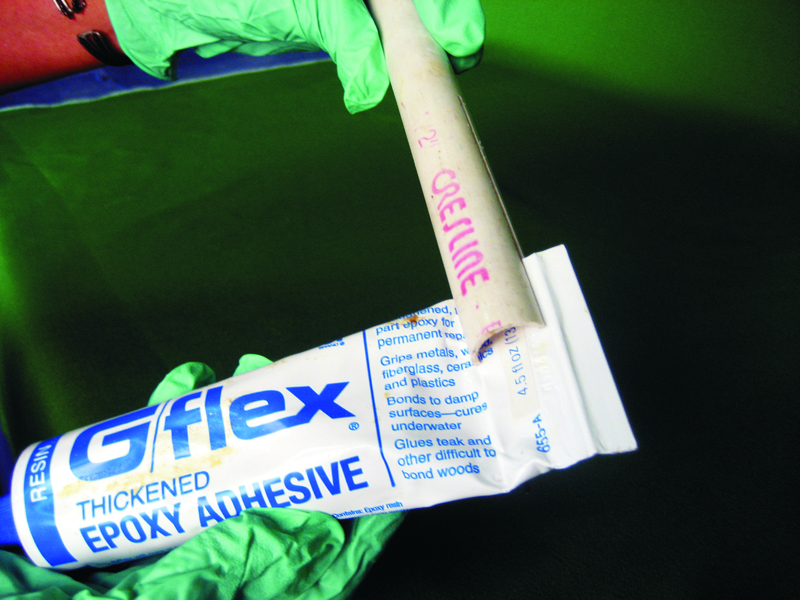 Maybe you’d like to get a fatter bead of adhesive or your tube is a bit clogged. Boy do we have the some easy and inexpensive tricks for you! Cut a 4″ long slot through the center of the PVC pipe. Insert the crimped end of the G/flex tube through both horizontal cuts in the PVC pipe. 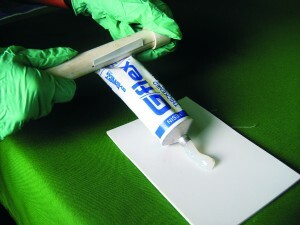 For added “G/flex appeal” add a PVC cap. Take hold of the handle and you’re now ready to roll. Not long ago this very subject was the topic of discussion that came up between J.R. Watson and me. Squeezing in a bit of shopping on my lunch, it just so happened that I found myself face-to-face with a display of tooth paste squeezers. On my way back to work I felt as though I had just solved all the world’s problems. Perfect! Or so I thought. Although the concept was good, the little tooth paste squeezer just didn’t stand a chance next to the rigid metal G/flex tube. However, it did give the innovative J.R. Watson an idea. Using very little time and effort, we whipped up this very cool gadget making it a snap to squeeze out the last drop of adhesive. You will obviously need to make two, one for the resin tube and one for the harder. But for simplicity’s sake we’ll just show one tube being created. Cut the 1/2″ diameter pipe to approximately 7″ long. The additional length creates an easy to grip handle. So, for you extra- large handed men, petite handed women or vise/versa, cut to length accordingly. 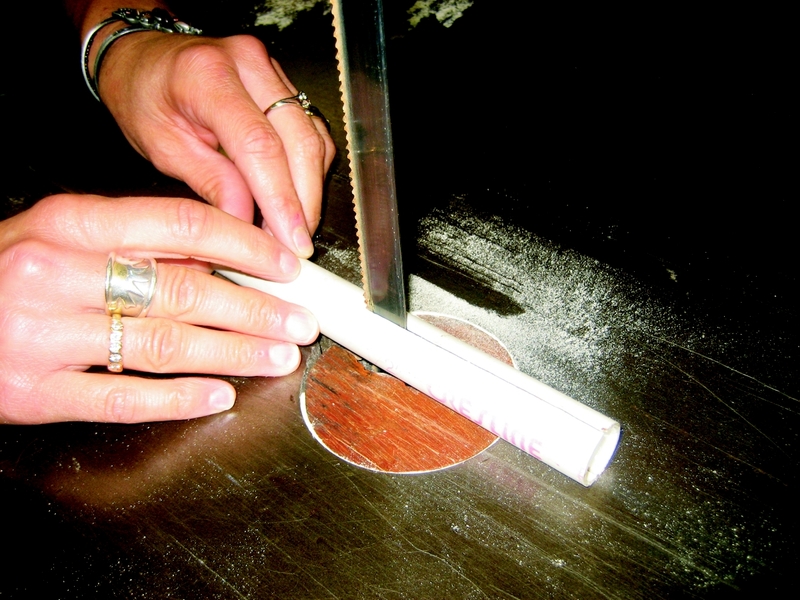 Cut a 4″ long slot through the center of the tube. Insert the crimped end of the tube through both horizontal cuts. 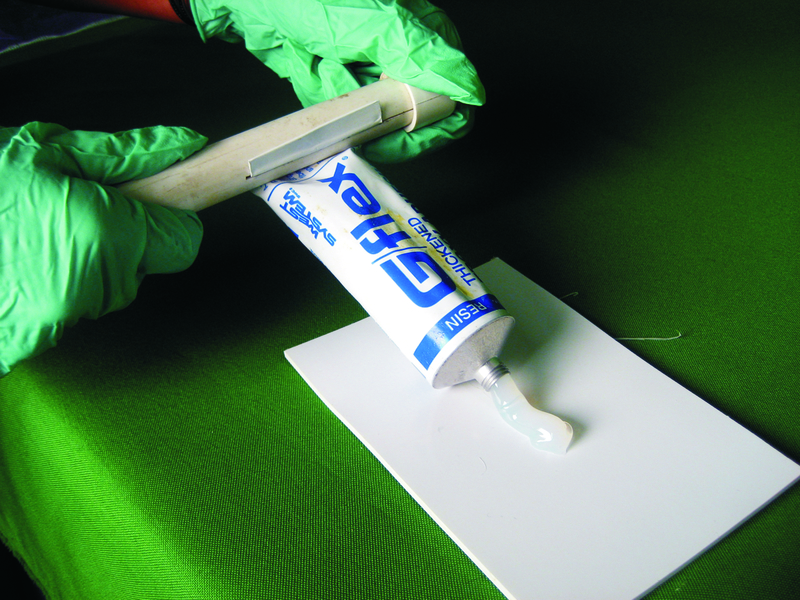 For added ‘G/flex’ appeal add a PVC cap. Take hold of the handle and you are now ready to roll. Simply poke the sharpened end of a pencil into the open tip, applying enough pressure to increase the diameter of the hole. It’s cheap, easy and works like a charm. 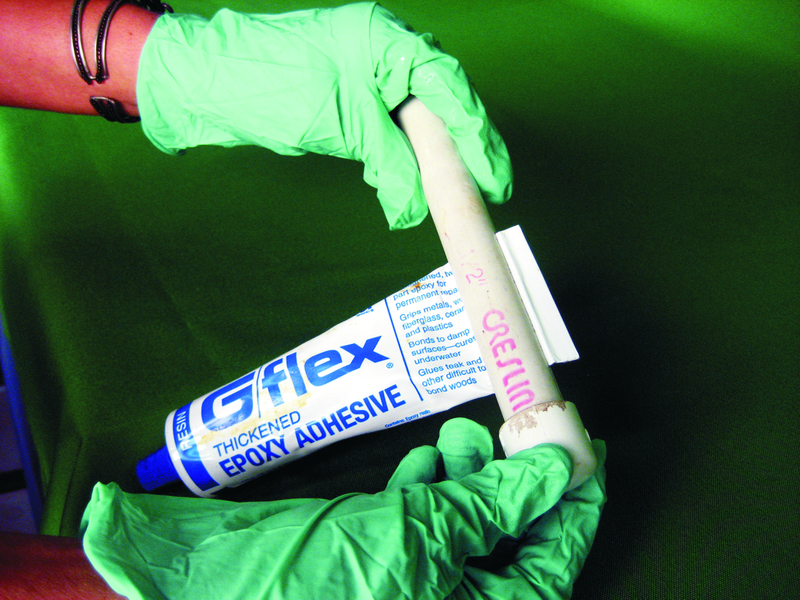 The amount of adhesive that comes out of the tube afterward can double in volume, depending on how far the pencil is inserted. …and Mom said that cheap and easy was a bad thing! This entry was posted in Epoxy Products, Techniques & Tips and tagged Epoxyworks #35, Fall 2012, G/flex, Julie Van Mullekom on June 23, 2015 by ewadmin.